Oracle's chief Larry Ellison recently promised he'll be hiring more staff than he'll be letting go from Sun Microsystems. But he is letting Sun staff go, and now that the Sunacle deal has closed, it's becoming clear just where Oracle's priorities lie. 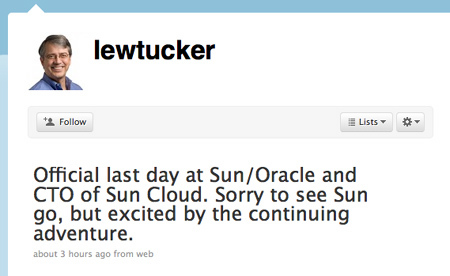 Among the departed is chief technology officer for Sun's relatively new cloud computing group Lew Tucker, who Tweeted Monday that it was his officially his last day at Sun/Oracle. Tucker, a former vice president of Salesforce.com's AppExchange applications market place, had been with Sun for less than two years and was handed the role of building out Sun's hosted cloud. Sun's copy of Amazon's cloud was killed by the Oracle deal, with the database giant's chief corporate architect Edward Screven saying last month Oracle has no plans to become a provider of hosted cloud services. Also gone is Chris Melissinos, a Sun veteran of 16 years who served as the company's chief gaming officer since the year 2000 and most recently as chief gaming officer and chief evangelist. Melissinos was a regular at Sun's massive JavaOne conference evangelizing the cause of Java games and mobile gaming - especially during the latter years under former chief executive Jonathan Schwartz. He blogged of his departure from Sun at the weekend and also Tweeted the news. Melissinos has gone as Oracle closed Darkstar, a line of gaming servers and software that Sun built and had hoped to sell and that Melissinos helped unveil during a "virtual" press conference in Second Life in 2006. Oracle, meanwhile, has said it will keep Sun's code hosting site Project Kenai alive. Chief architect and vice president of tools and middleware Ted Farrell has said Oracle will merge Project Kenai with Java.net as it doesn't make sense to continue investing in multiple hosted development sites. "I think we did a poor job at communicating our plans for Kenai.com to you," Farrell said here. Farrell said in January that Oracle planned to close Kenai, bring it in-house, and re-release Kenai if it found some value in the project.